Upper Geyser Basin. Geology Sheet XXIV. 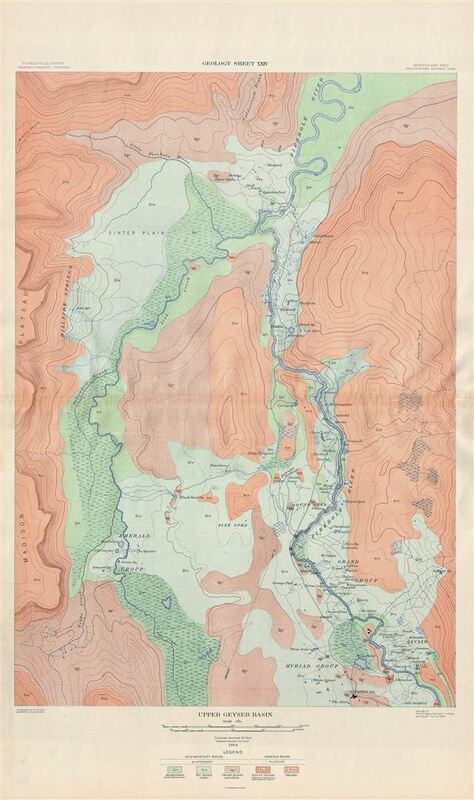 A fine example of Arnold Hague's 1904 geological survey map of the spectacular Upper Geyser Basin in Yellowstone National Park, Wyoming. Focusing on the Iron Creek and the Firehole River, the map covers from the famous Old Faithful Geyser northward, along the river, as far as Coldstream Brook and Mystic Falls. Flowing along many famous geyser basins of the Yellowstone Park, the Firehole River is surrounded by numerous geothermal features. The map identifies numerous geysers and other sites of interest throughout, including the Emerald Group along the Iron Creek, the Grand group and the Myriad Group along the Firehole River, Hillside Springs and Pine Spring. The Upper Geyser Basin and Geyser Hill are set on the rim of the caldera and has the highest concentration of geothermal features in Yellowstone Park. This particular map was part of Hague's study of the regions unique geology and the related geothermal activity. Also identifies the site of the historic Old Faithful Inn. The map is color coded to identify different geological zones with a detailed key at the bottom of the map proper. Published by the United States Geological Survey in 1904.